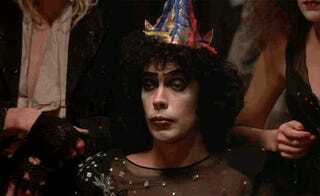 Even Frankenfurter wants in on this one! He's trying to hide it, but the hat totally gives it away. So, what's up everyone? Let's get this party started! Share your thoughts, feelings, hopes, TMI, grocery list - we want to hear it all! Here's last week's open thread, thanks to the awesome Cheerful_ExGirlfriend!